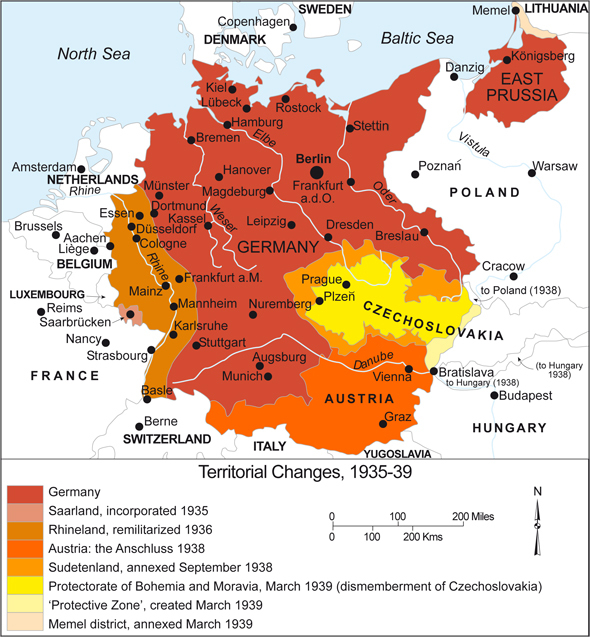 This map shows the territorial expansion of Germany between 1935 and 1939, that is, before the beginning of the Second World War. The process started in 1935, when residents of the Saar region, which had been ruled under a mandate by the League of Nations since the Versailles Treaty, decided to join Germany after holding a popular referendum. This was followed in March 1936 by the German army’s occupation of the Rhineland, which had been demilitarized after the end of the First World War. Hitler then legitimized the occupation by staging a popular referendum after the fact. In March 1938, after making a series of intimidating moves and threats against the Austrian government, Hitler’s Germany annexed his native Austria and incorporated it into the Reich as the Eastern March [Ostmark]. Again, Hitler staged a popular referendum to retroactively legitimize the so-called Anschluss [annexation]. None of these moves met with any appreciable resistance from the local population or the Western Allies, despite the fact that the remilitarization of the Rhineland represented a violation of the Versailles and Locarno treaties. Thus, in September 1938, Hitler moved on to the next phase of his plan: the liquidation of Czechoslovakia. First, he demanded the incorporation of Czechoslovakia's Sudetenland – a region inhabited by ethnic Germans – into the German Reich. After prolonged negotiations with the Western Allies (above all Great Britain), who feared another European war, the Sudetenland was ceded to Germany in the Munich Agreement. This agreement, however, was made without Czech participation. In March 1939, German troops went on to occupy the rest of Czechoslovakia, where they established the “Protectorate of Bohemia and Moravia.” Slovakia was declared a German satellite state, and a “protective zone” for the stationing of German troops was established on its western border. In the same month, German troops occupied the Lithuanian Memel region, which Germany had lost under the Versailles treaty. Lithuania, which governed the region, was forced to sign a treaty that returned the Memel region to Germany. At this point, the aggressive and confrontational nature of Hitler’s foreign policy could not be ignored any longer. As a result, Great Britain guaranteed Poland’s sovereignty and promised its support in case of an attack. Source: Map 1, "Territorial Changes, 1935-1939," in Germany and the Second World War, edited by the Research Institute for Military History, Freiburg im Breisgau, Germany. Volume I, The Build-up of German Aggression, by Wilhelm Deist, Manfred Messerschmidt, Hans-Erich Volkmann, and Wolfram Wette. Clarendon Press: Oxford, 1990.